Always Fall Forward: Life Lessons I'll Never Forget from "The Coach"
"Make your mistakes full speed." "Always fall forward." "There are worse things than dying." Todd Gerelds, author of the bestselling book and hit movie Woodlawn, believes the most meaningful life lessons he has learned have been on the playing field. The voice of his coach rings in his head when life gets tough or when his day becomes off-kilter. It just happens that his coach's voice is also his father's. His dad was Tandy "The Coach" Gerelds, the subject of Woodlawn and the man who led his team to victory in the racially charged atmosphere of 1970s Alabama. The Coach led his team both on and off the field, always speaking wisdom wherever he went. For him, leading his team wasn't a responsibility he took lightly. After all, the Coach wasn't just training these boys to be good football players--he was helping them build the foundation to becoming good men. 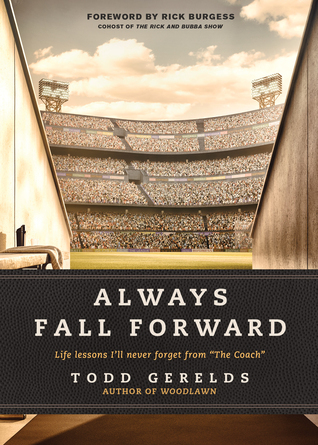 In Always Fall Forward, join the Coach's son, Todd Gerelds, as he reflects on fifty-two of his dad's most formative "coachisms." From "Your stance is critical" to "One play at a time," you, too, will start hearing the strong and encouraging voice of the Coach when life hits you hard. Packed with life application, Always Fall Forward challenges men each week to live the way the Coach lived--grounded in faith and willing to stand up for what he believed--no matter the cost. You won't want to forget these lessons--both on and off the field. - What did you like about the book and why? At first I thought it was going to be smug and pretentious or stuffy or maybe it would be a sad homage to a man that was loved by his son. I enjoyed that fact that it was a little of both but with good spirit and uplifting moments blended in. You can really tell that this author has a love for his father and a respect that went deep. - What did you not like about the book and why? While I understand the point of the book, I feel like the author could have shown more sides of the stories and feelings in a way that was more connecting instead of kind of putting it out there. - What did you learn? Again I feel like the author really had a love and respect for his father and wanted to share his knowledge with the world. - To whom would you recommend this book and why? A male late in their years or to someone who has just lost a father, perhaps someone who needs a bit of support and healing.